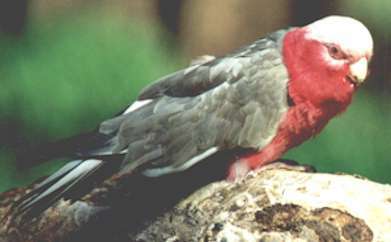 Pink and grey galahs are Australia's most familiar parrot and a popular pet. They are a beautiful bird, pets to many homes but also a pest to many farmers. Found throughout most areas of Australia, including Tasmania and offshore islands. Galahs have a grey coat, rosy chest and underpants and a white or light pink crest. Their beak is bluish white and their legs are dark grey. The female's eyes are pink and the male's eyes are darkly coloured. Their main diet consists of seeds, but they also eat roots, foliage, flowers, nuts, fruits and insects and can grow up to 40cm. Farmers' crops are often destroyed and around one fifth of the total amount of grain crops in New South Wales alone is destroyed every year. Galahs are strong, fast flyers and can reach speeds of up to 50 km/ph.